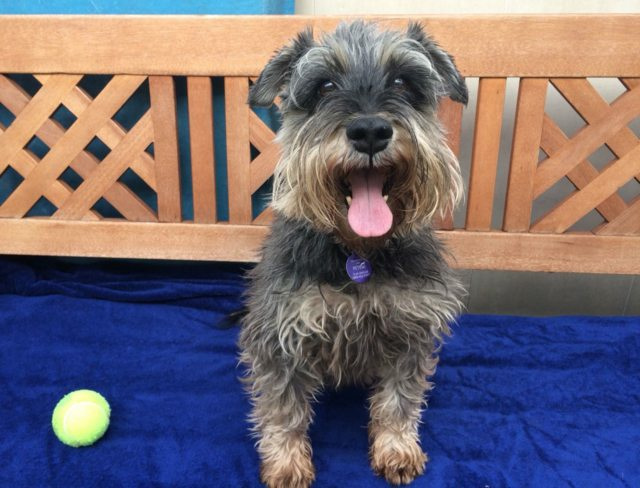 Troy is a nine year old male Miniature Schnauzer. He’s an active, cheerful and affectionate dog. He’s also super playful and always enjoys a good game with his toys, his favourite toy is a tennis ball. He also loves giving high five! Troy can be grumpy around other dogs so he’s looking for a rural or semi-rural home with an experienced owner. He can live with sensible teenagers but will need to be the only pet in the home. He’s been known to bark when left home alone so he’ll need a home where there is someone around for most of the day. Troy has been neutered, microchipped, vaccinated and is up to date with flea & worm treatment. He has also been health checked and behaviourally assessed. Please visit www.themayhew.org or call 020 8962 8000 for further details. The Mayhew Animal Home Trenmar Gardens London NW10 6BJ If you are interested in adopting an animal, our viewing times are: Weekend by appointment and Tuesday to Friday between 12 - 3.30pm, no appointment is neccessary on weekdays but there will be a waiting period, particularly on Tuesdays and Fridays when we tend to have more visitors.